There are 2 categories of rotorhead designs: fully articulated and hingeless. The former uses 3 hinges for each blade; one for the feathering axis, one to support flapping up and down, and one to support lead and lag blade movements. On the other hand, a hingeless rotorhead (sometimes known as rigid, which is not a very accurate description) uses materials that are both strong and, to some degree, flexible. Moreover, the blades are also designed to incorporate some form of flexibility. No moment transmitted to rotorhead. The rotorhead doesn't have to be very strong, and so can be lighter. 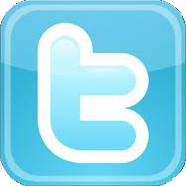 Blade movements, for example due to turbulence, are, to some degree, not transmitted to the rotorshaft and hull. A lot of hinges also require a lot of maintenance. Because moments are not transmitted to the rotorhead, the hull will not follow the rotordisc attitude. The rotorsystems have less control power. Unlike a fully articulated system, moments are transmitted to the rotorhead, which must be able to cope with these forces. Because (to some degree) moments are transmitted to the rotorhead, the attitude of the hull will try to follow the rotordisc's attitude. This rotorsystem has a high degree of control power. Because there are no hinges, less maintenance is required. Of course, in between these 2 solutions, other designs also exist, an important example being the 2 bladed, semi rigid, rotorhead which uses feathering hinges for pitch control. Its 2 (opposite) blades are mounted in one, teetering, hinge. So, if one blade flaps up, the other has to flap down. In this design, the blades are mounted (fixed) in the rotorhead at the average coning angle, in order to prevent blade stress. By using a gimballed teetering head, the rotordisc can tilt in any direction. In this way, the Hookes' joint effect is absent, so there is no need for lead and lag hinges. These are also un-necessary if an underslung rotor design is used. This 2 bladed teetering rotorhead system has already been in operation for many years, ever since the famous designs from Hiller and Bell. Good question. I must admit that it is not explained anywhere on the Helistart website. In a hingeless rotorsystem, the function of the hinge is done by some rigid stucture. However, that stucture is not totally rigid, it can flex to some degree in the desired planes of rotation. So, have a look a the picture of the hingless rotorhead and focus on the white structure (plate) in the middle. That white stucture is semi rigid an functions like a hinge (actually two: to support flapping and feathering)! 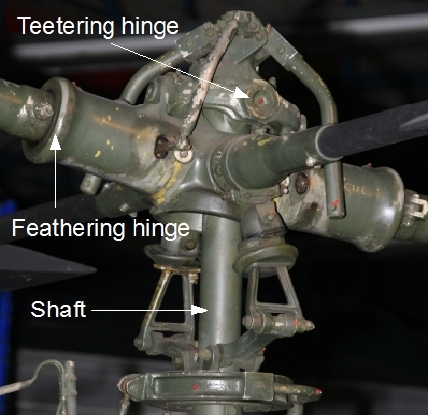 In a Hingeless rotor head, the blade is statically mounted to the head. Cyclic and Collective pitch moves the Pitch Hinge that twists the entire rotor. 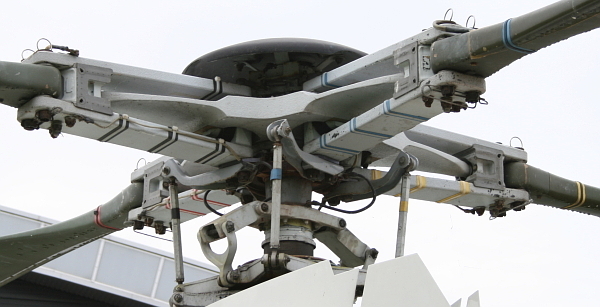 The Fully Articulated rotor head adds two hinges. The drag hinge and the flap hinge. 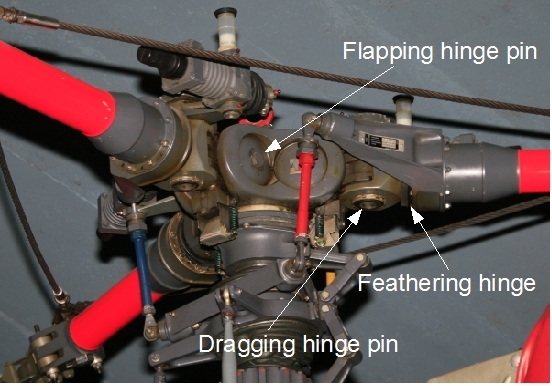 Drag hinge allows the rotor to advance ahead or fall behind the rotor rotation. Flap hinge allows the rotor to tilt up or down. The Teetering rotor head only adds the flap hinge. Thee only time that a fully articulated rotor does not control fuselage attitude is when the blades flap at the axis of rotation. Otherwise each blade exerts a tension moment at its flapping hinge that acts on the hub and leverages the shaft until it is perpendicular to the rotor tip-path plane.